Accidents are a daily phenomenon to most houses of New York and thankfully most of them are unimportant and the consequences trivial. In spite of that many domestic accidents happen in the garage and if we could study the medical records, we would see that the victims were injured by heavy garage door parts. Don’t forget that the aluminum overhead doors of your house in Freeport are extremely heavy and, hence, they must be maintained carefully and often. What are the 3 worst accident scenarios? Accidents caused by a collapsing door. 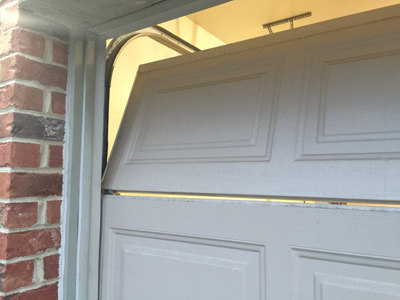 Thankfully, it's not a frequent scenario because current garage doors do not collapse that easily. Though, their stability depends not only on the good materials and excellent quality garage door repair parts but, mainly, on the frequency and quality of garage door maintenance. As a consequence, you must acquire the proper knowledge and get the right tools before you attempt to fix any problems and never postpone repairs under no circumstances. One of the most significant tasks, which can prevent a door from collapsing on somebody, is garage door opener sensors maintenance because sensors are responsible for the activation of the reverse mechanism. Accidents caused by springs and cables.They can both snap and since they carry a lot of strength and are wound under enormous tension, they can cause terrible injuries. They both need to be taken care of with care and from a distance wearing gloves to protect your hands and covering your face with something firm. You need to remember that you might need to release the tension of the springs, if a garage door cable snapped and you need to fix it. They can even cause fatal accidents. Accidents caused by the power. Don't forget that some parts are electric and, hence, when you are fixing them, you need to unplug the unit. People don't get electrocuted easily these days, but you don't want to take your chances. Your life may depend on a plug.